At the end of every year, I agree to write up a summary of accomplishments for the T&L Innovations team. This year, my task is bigger, messier and more complex than ever. That is because our team has grown, and our responsibilities multiplied. At the end of the day this feels like success, but at the end of the year, well, it is overwhelming. So, instead of writing about the many accomplishments of our team, I will use this space to focus on our most important goal. 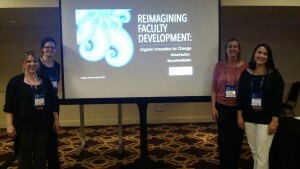 Creating untethered faculty development and support. Starting in the Fall of 2014, we set out to build a structure that provides options for all our faculty to become engaged in the process of improving teaching and learning. Given the diverse nature of our faculty, varied approaches to teaching, and wide-ranging work schedules, this is no easy task. 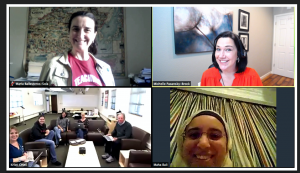 The concept of untethered faculty development allowed us to think about how we could deliver support and connect faculty from anywhere at anytime. We set out to create, curate, and share information to support teaching & learning that would be accessible to all, easy to find, and compelling to use. Online Resources: We provide resources and ideas through our toolkit on our CI Keys site. The resources range from using VoiceThread, to creating engaging videos, to designing and facilitating quality online and blended courses. This site is regularly updated. On this site we have also been able to articulate and share information about our programs and vision. Social Media: Through our blog, Twitter, and Facebook, we have been able to engage with faculty beyond our traditional means. Our weekly blog is primarily authored by faculty at CI and is full of stories about teaching and learning at CI. Each blog post gets an average of 187 views with our top post approaching 600 views. Twitter and Facebook provided us with a means to build an audience for our blog, share relevant information and interact with peers both at CI and other institutions. 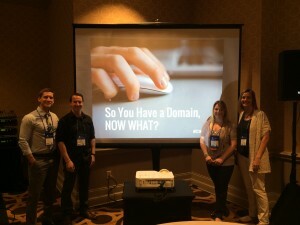 One example of how our social media connections are enhancing our efforts and connecting CI to a global network of teaching and learning can be found in the Chronicle of Higher Education Profhacker blog, Consider Perforating Your Meeting, authored by Maha Bali from the American University in Cairo. Traditional Email: Yes, we also use traditional means of communication. We regularly use the Division of Academic Affairs email to share information, make announcements, and send out invitations. That said, we like to think we have added a little something to a traditional email. We use email to not only announce events, we also use those announcements to provide resources for people wanting to dig deeper into a topic. If someone is interested in an event, but cannot attend, we want them to be able to access information on the topic and dig a little deeper as time permits. Workshops & Programs: Over the past few years we have built two hallmark programs, countless workshops, and a series of community gatherings to prepare faculty to teach in the ever-evolving digital world. Each program is unique and serves its own purpose. See our Pathways video below for more information. One distinctive feature of all our events is that faculty are invited to participate virtually. We understand that not everyone can be on campus all the time, so we use tools such as Zoom and Google Drive to allow full participation of remote participants. In case you were hoping for the more traditional end of the year summary of accomplishments, here is a breakdown in numbers. 2 amazing Faculty Fellows, Jaime Hannans and Jacob Jenkins, helped us kick off our Faculty Fellowship program. 1 superb faculty lead, Maria Ballesteros-Sola, joined our team to support our Online & Blended Community efforts. 19 faculty successfully completed the Online Teaching Preparation Program (OTPP) this year. T&L Innovations has featured 8 CI faculty on our Blog . 820 Recorded visits to the FIT Studio, but not everyone remembers to sign in! Close to 100 active faculty VoiceThread users. Over 50 course sections signed up to participate in openCI, our new affordable learning program. $114, 000 brought in through grants and Chancellor’s Office Initiatives. 11 Professional Presentations and 3 Invited Keynotes (Yes, Michelle Pacansky-Brock is a Rockstar).